12 Fudgy rich chocolate cake pops coated in delicious white or milk chocolate, with cream cheese frosting running throughout. Intricate designs in a holiday theme are hand-decorated. Fill out the form below to request an estimate. If your order is below 12, expedite your order by making an immediate purchase using the form on the tab above: "Order Now". This adorable Holiday treat has a secret combination of ingredients to make it ridiculously delicious!! Our rich, fudgy, double chocolate cake recipe is baked then mixed with just the right amount of cream cheese frosting; made into bite size cake balls; drenched in white chocolate or milk chocolate coating; placed on a stick, then embellished with beautiful assorted Holiday designs. 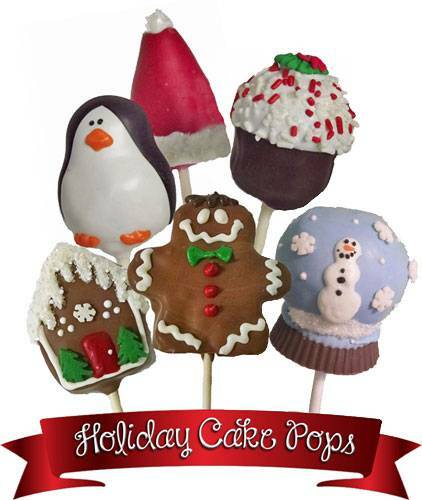 Our assortment includes six designs: Penguin, Santa's Hat, Cupcake, Gingerbread House, Gingerbread Man and Snow Globe Some describe it as a truffle; some say the inside tastes like brownie batter. However you describe it, you will be hooked! These are great as party favors, a superb, memorable gift or just a delicious chocolate treat.